CC eyes the ducks at Polliwog Park in Manhattan Beach. Honestly, we should have visited Polliwog Park in Manhattan Beach sooner. It's really close -- about 15 minutes from us on the 405 -- and it has a lot to offer kiddos big and small. When we visited on Saturday, there was a big Earth Day celebration going on, complete with organic fruit booths as well as tribute bands to Janice Joplin and Jimi Hendrix. There was also the awesome Auntie's Fry Bread food truck that took me back to my American Indian roots with a yummy chicken ranch fry bread concoction. But more than those things, what was really fun was the park itself. There's a lovely duck pond, a playground for smaller kids that hugs the edge of the water, as well as a play area for bigger kids that we didn't get to this time. CC loved it. So did we! She played pirate on the little playground ship and slid down the twisty slides. I think my favorite part, though, was watching her play over the underground misters near the cute lighthouse. Nothing says "cool" like bearing (almost) all to beat the heat. CC enjoys the misters at Polliwog Park. As I mentioned in my L.A. Times Festival of Books post, CC and I attended a "My Little Pony: Friendship Is Magic" screening on the USC campus and stayed for the fun Q&A with showrunner Meghan McCarthy and Tara Strong, the voice of Twilight Sparkle. CC brought a herd of My Little Pony figures, which she played with on the floor after the screening. It was all-pony, all-the-time for her. What surprised me about the screening, though, was that the audience was made up of fervent fans (not the surprising part), and half of them were teenage boys, aka Bronies (the surprising part). In fact, one mom was there with her preschool-age daughter and her teen son. These guys knew the lyrics to the theme song, had Twitter back-and-forths with Strong and laughed the loudest during the screening's funny parts. Tara Strong, left, and Meghan McCarthy discuss "My Little Pony." UPDATE: Congrats to John, who won the kids' replica Clayton Kershaw jersey! Thanks to everyone who participated (and to Random.org for helping me decide). Stay tuned for more giveaways! This giveaway is sponsored by the Los Angeles Dodgers. Sunday is Family Day at Dodger Stadium, and April 29 is no different. On Sunday, the Dodgers will play the Washington Nationals (1:10 p.m.), and the first 15,000 kids ages 14 and under will receive a special treat -- a replica Clayton Kershaw kids' jersey, courtesy of Dreyer's Grand Ice Cream. Not only that, but families can come early for Viva los Dodgers, a weekly festival of live entertainment. This week, Wilmer Valderrama, local band The Tinder Box and the cast of "Q'Viva: The Chosen" will perform. The festivities start two hours before game time (and continue until 1:10 p.m.) in Lot 6. Stick around after the game and have your kids run the bases. CC hasn't done this yet, but it's definitely on our list of things to do. Buy tickets here ($10-$160 each). I'm giving away 1 replica Clayton Kershaw kids' jersey (pictured above), courtesy of the L.A. Dodgers. To enter, leave a comment below telling me about the best time you've had at Dodger Stadium. Good luck, and I will announce the winner on Thursday, May 3! We had a fabulous time at the Los Angeles Times Festival of Books this weekend. The weather has been especially overcast and chilly lately (what's up, LA? ), so I was happy when we arrived to a bright and sunshiney USC campus on Sunday. After first checking out a book-friendly episode of "My Little Pony Friendship Is Magic" -- the episode was called "Read It and Weep" (stay tuned for the video Q&A and "Brony" musings tomorrowlater this week!) -- CC and I met up with Ian and wandered around campus exploring book booths. At one point, CC plopped down under one of the leafy green trees and asked if I would read her a story. It was so sweet and simple, and we had a lovely time. We had an awesome lunch at the on-campus lemonade -- yay blueberry mint lemonade and SoCal comfort food! -- after which CC found a way to turn seating into a kid-friendly slide. When we finally hit the Target Children's Stage, the adorably energetic Jose-Luis Orozco was singing the ABC song in English and Espanol to the kiddos. Jose-Luis Orozco performs on the Target Children's Stage. We capped off the day by buying CC a book she can't put down -- "Camilla the Cupcake Fairy Sticker Activity Book." A big success in my (ahem) book. 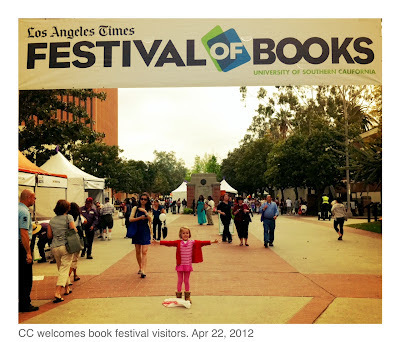 This is one of my favorite times of the year -- when the annual Los Angeles Times Festival of Books arrives on a gorgeously sunny and sprawling L.A. campus. This weekend, April 21-22, the event will be held for the second year in a row at USC. As usual, there will be tons of author panels, publisher booths and the always-awesome Target Children's Stage, featuring authors Jeff Kinney ("Diary of a Wimpy Kid") and Julie Andrews ("The Very Fairy Princess") and musical group The Squeegees, among others. Last year, I had the chance to interview author Dallas Clayton and the kids from "Judy Moody and the Not Bummer Summer." The year before that, CC and I hung out with the Fresh Beat Band backstage. And speaking of "My Little Pony," on Sunday, April 22 at 1 p.m., the festival will screen the episode "Read It and Weep" from "My Little Pony Friendship is Magic." Not only that, but Tara Strong (voice of Twilight Sparkle) and showrunner Meghan McCarthy will participate in a Q&A. I also hear there will be giveaway items at the panel, too. Exposition Boulevard and S. Figueroa St.
With cake decorating, bouquet building and horseshoe tossing, CC had never been to a "bridle shower" like the one hosted by The Hub at Royal/T last weekend to celebrate an upcoming "Royal Wedding." 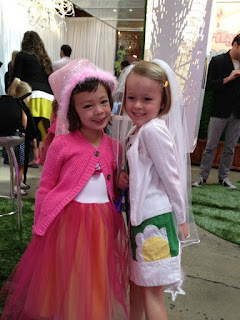 On Saturday, April 21 at 10 a.m. PT, the kid-friendly network will air two back-to-back episodes of "My Little Pony Friendship Is Magic," this time featuring "A Canterlot Wedding." 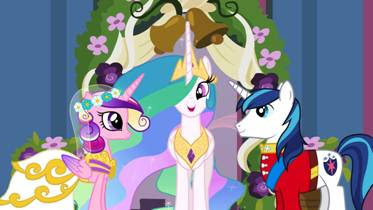 Princess Celestia's niece, Princess Cadence, and Twilight Sparkle's brother, Shining Armor, are set to tie the knot -- until things start to go horribly wrong. Who is Princess Cadence? What's this pony really up to? Is it really her? So many questions! CC and several of her pals caught a sneak peek of the episodes, and let me tell you, it had kids on the edge of their seats -- in this case, beanbags. In fact, CC asked if she could watch the whole thing over again once we got home. We even got to take home a mini wedding cake (in addition to Hub-centric goodies), which CC decorated, courtesy of The Butter End. It's definitely the best "bridle" party CC has ever attended. You might have noticed that the last couple of weeks have been a bit sporadic when it comes to my posting. That's because I've just started -- just today, in fact -- a full-time job as an editor at BermanBraun, a media company in Santa Monica. 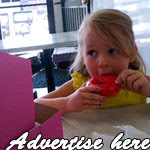 I'm very excited about it, especially because the site I'm working on is all about moms. It hasn't launched yet -- stay tuned for later this spring! -- but I'll be sure to give you all the details once it's live. Just so you know, though, it's going to be really cool. It's very thoughtful when it comes to both content and design. 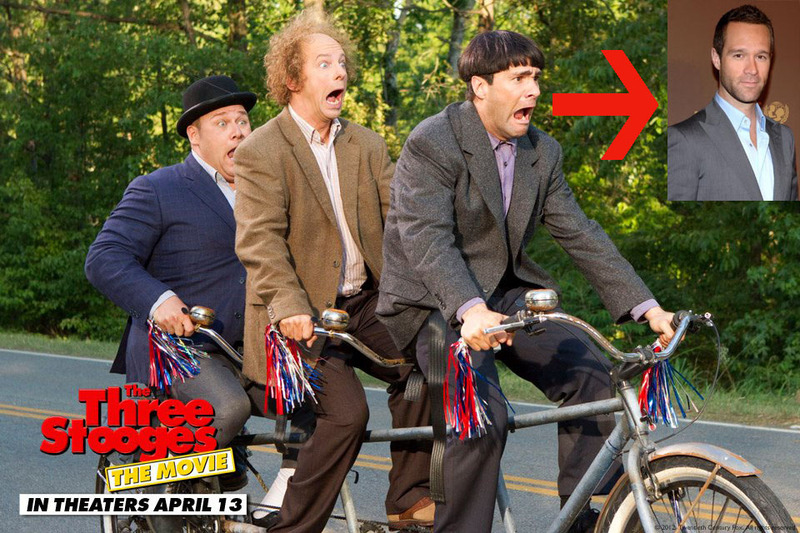 Chris Diamantopoulos looks very different as Moe in "The Three Stooges." "The Three Stooges" movie hits theaters today (check out my review here), and I had the chance to interview actor Chris Diamantopoulos, who plays an awesome Moe in the PG-rated film by Peter and Bob Farrelly. And, according to "The Three Stooges" website, he was "destined" to play Moe: "He was born four days after the death of Moe Howard (May 4, 1975); he's lived in the same Hollywood apartment building as another of the Stooges, Larry Fine; and filming began on Chris' 36th birthday." Chris Diamantopoulos: A man after my own heart. 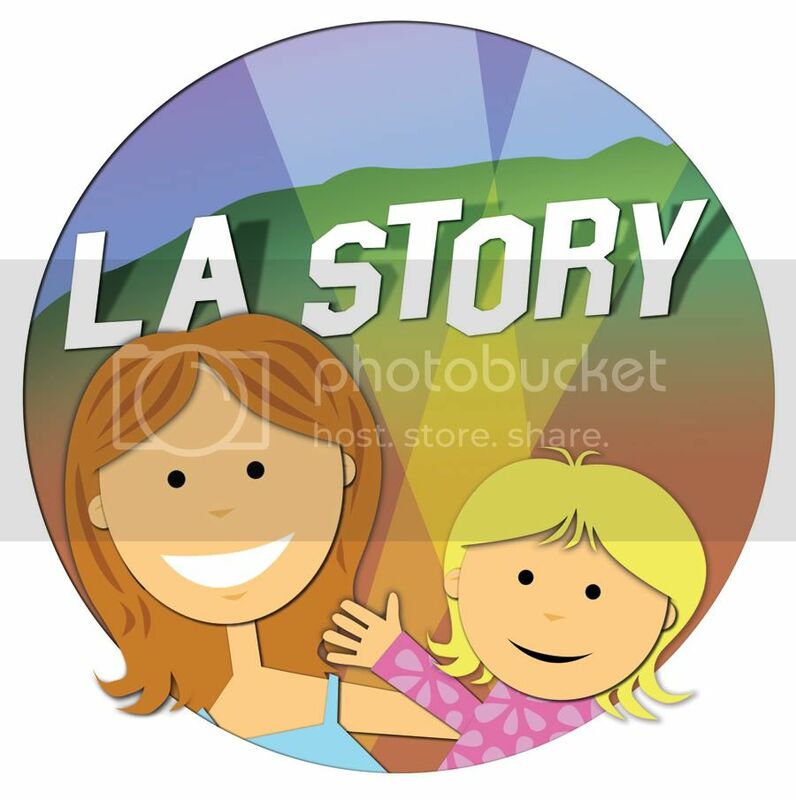 L.A. Story: ... and we were interested in showing our 5-year-old daughter a lot of the sketches. You guys were so spot on, and your Moe was so amazing. What type of preparations did you make for this role? Chris Diamantopoulos: Thanks for the kind words. I'll start off by telling you that my 18-month-old son is in his high chair with his mom watching "Pop Goes the Easel." They're watching "The Three Stooges." It's a very strange thing, and I don't know how smart an idea it is. but the only thing that puts him in a docile state to eat is if the Stooges are on. He must be remembering past events because he was on set with us when he was 6 months old. But he really loves the Stooges. I'm not kidding. Preparing for the role was fun. First you work on the voice, you work on the mannerisms, and you find the little idiosyncratic behavior that makes Moe, well, Moe. To me, that's what takes it from an impression to sort of more of a living, breathing thing. In this instance with the Stooges, it was kind of a lifelong endeavor because I'd been such a fan since I was a child. And I really researched and studied them as a kid. It's funny, the things that kids get interested in and become hobbies for kids, whether it's a video game or "Dungeons and Dragons," or, for me, the Stooges, you never really think that all that time spent will ever amount to anything, certainly not in your adult life. L.A. Story: Regarding the stunts in the film, some of the scenes looked dangerous. Did anyone get hurt? Chris Diamantopoulos: We did, in fact, get hurt. You know, you can't make a movie like "The Three Stooges" and expect that you're not gonna get hurt. We went into it knowing that we wanted to be as authentic as possible, and we knew that the boys back in the day actually did hit each other, especially if it meant, for some reason, the bit wasn't working based on where the camera was and they just had to actually hit each other. We slapped each other and punched each other, and I dislocated my shoulder and I broke a finger. I know Sean (Hayes) scraped up his leg. We fell off a rig. The truth of the matter is we were shooting, for all intents and purposes, an action film that had comedy in it. There was so much action. It was great fun, though, I have to say. L.A. Story: My daughter laughed at all of those parts. It was really funny watching her laugh. Chris Diamantopoulos: OK, that's fabulous. God, that's great. We had the premiere last weekend, and there were a bunch of kids, probably aged 3 1/2 on up. And the overriding consensus that I seemed to gather from that premiere was, the Stooges are basically the Looney Toons, but with real people. For example, when Bugs Bunny would drop an anvil on Elmer Fudd's head, kids would laugh. And it's because you know that they're cartoons and you know that they're safe and the reaction is funny. With the Stooges, they're real people, but the sound effects keep it all in a safe place. When asked by the moderator how he enjoyed working with the Farrelly Brothers, Diamantopoulos said, "On a personal level, you can't find two nicer guys than Pete and Bob Farrelly. And I'm saying that with all due sincerity -- they're just super conscientious, super sweet, and they treat everybody, from the catering all the way up to the stars, exactly the same way." So are more family-friendly movies in Diamantopoulos' future plans? "From the perspective of a father, I'd love to do more family films," he said. "But I'd also love to do a David Fincher movie." 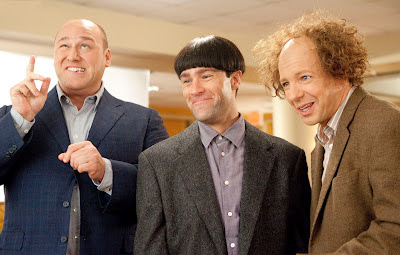 Will Sasso, l-r, Chris Diamantopoulos and Sean Hayes star as Curly, Moe and Larry in "The Three Stooges." When CC, Ian and I caught an advanced screening of "The Three Stooges" movie, directed by Peter Farrelly and Bobby Farrelly, I had no idea that my child would laugh so hard and so often. After the movie, the woman sitting next to me even remarked on just how much fun CC seemed to be having and that she wanted to take her 6-year-old son to see the movie based solely on her reaction. And since the film, my daughter has essentially become a fourth stooge, saying things like, "A wise guy, eh!" and pinching her parents' noses on a regular basis. The movie was a charming and nyuk-nyuk-filled adventure that paid loving homage to the trio of wise-crackers who were slapstick geniuses. The three modern embodiments of Larry, Moe and Curly (Sean Hayes, Chris Diamantopoulos and Will Sasso, respectively) were more than convincing in their adoptive roles. And speaking of adoption, that's where the movie starts -- at an orphanage run by nuns. (Crazy nuns. Crazy Larry David-style nuns. But definitely loving nonetheless.) While not successful in getting adopted themselves, our trio of trouble grows up in the orphanage, which is struggling to survive. In order to help save it, the stooges go on a quest to earn more than $800,000, using only their (half)wits. Their adventure takes them to a wealthy family, which harbors a murderous plot, as well as to a famous reality TV show. What made CC laugh most in the movie were the stooges' slapstick routines. Every time one got popped in the nose or knocked over the head with a sledgehammer, CC was rolling in her seat. (Eek, what does that say? Oh, nevermind.) The plot details were definitely secondary for her. But don't worry, parents. There's a fun safety message at the end of the movie that reminds kids not to try these stunts at home. What struck me the most, however, was how well the actors portrayed their famous counterparts. Particularly Diamantopoulos, who looks nothing like Moe! I was actually really moved by one emotional scene, when Diamantopoulos as Moe realizes the real message of the movie: that it's family that matters most. Stay tuned for my next post -- an interview with Chris Diamantopoulos! As I said yesterday, our Easter weekend was jam-packed. After our trip to Underwood Farms on Friday, we drove down to Olvera Street on Saturday afternoon for the annual Blessing of the Animals. Ian and I are hoping to visit Olvera Street again soon. It's like stepping back in time, what with the crowded vendors and the oldest house in Los Angeles -- Avila Adobe, built in 1818. There are also tons of Mexican restaurants, complete with wandering mariachi bands. I was eyeing delicious-looking burritos and margaritas. Perfect for a hot spring day. Cheers to a blessed Easter! CC with the Easter Bunny at Underwood Family Farms. Happy Easter! Hope your weekend was fun and relaxing. We started dyeing eggs on Thursday and had a jam-packed weekend from there. On Friday, we hit Underwood Family Farms, which was having its annual Easter celebration, complete with baby animals, "grain train" rides and Mr. Easter Bunny himself. CC was even able to indulge in a little Easter egg hunting while we were there. CC hunts for treat-filled eggs. Living in the city, I always think it's nice to get out of town and see nature once in a while. Luckily, in LA, that's easy to do. I'm sure you've heard this before, but getting out to the mountains, the ocean, the slopes or just the wide open spaces is pretty easy to do here. Everything is within a couple hours' drive. The Easter version of Underwood Farms is lovely and a bit smaller than its annual Fall Harvest Festival, which we've visited a few times. Admission was much lower, at $6 per person. We were able to lazily wander along the more compact grounds, and CC was even able to pet some bunnies, sheep and little goats at the petting zoo. I'll just have to remember next time that it gets really hot. Water is a must! For all those little Angeleno bunnies out there who are readying their Easter baskets, there are a few fun goings-on around L.A. this weekend. 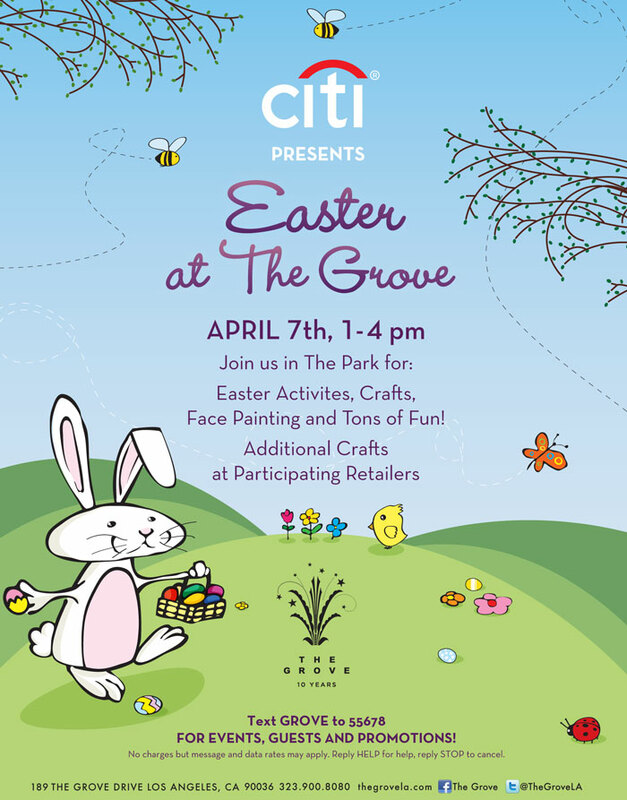 Face painting, crafts and other activities will be on the program Saturday from 1-4 p.m. at the Grove. Visit participating retail stores for even more Easter fun. 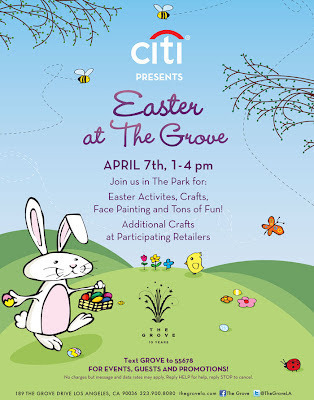 Kids can get their bunny on at this weekend-long event at the L.A. Zoo. Big Bunny's Spring Fling kicks off on Friday and runs through Sunday from 10 a.m.-4 p.m. each day. Families can enjoy live musical entertainment, pet some bunnies and even have their picture taken with Big Bunny himself (for a small fee). CC and I loved it when we visited a few years ago! Tykes can indulge in an animal-friendly day downtown on Olvera Street with the annual Blessing of the Animals on Saturday. There will be free pony rides and a petting zoo. While the event starts at 12 p.m., and runs until 6 p.m., a procession with Archbishop Jose Gomez will begin at 2 p.m.
Who doesn't love Elmo? The adorable, fuzzy red creature is one of CC's favorite characters, and I can understand why. He's loving, cuddly and encourages kids to be happy with who they are. 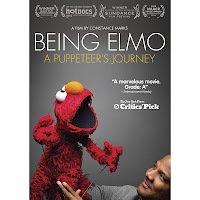 That's why I'm excited to share the news that documentary film "Being Elmo: A Puppeteer's Journey," about "Sesame Street" Elmo puppeteer Kevin Clash by filmmaker Constance Marks, will be airing on PBS Thursday, April 5 at 9 p.m. (check local listings) and again on Monday, April 9 at 9 p.m. (check local listings). Not only that, but the DVD of the film also hit shelves today. According to Marks, there's a lot of fun behind-the-scenes bonus material that's also included. The film explores how Clash created the character, as well as the obstacles he faced as a kid who wanted more than anything to be a puppeteer -- a goal that wasn't exactly encouraged by other kids his own age. CC and I missed the doc when it made the festival rounds in Los Angeles last year. In addition to scheduling conflicts, I was also worried that seeing Elmo operated by an actual human being might take away some of the mystery for CC. I had the chance to speak with director Constance Marks about the film -- and this very concern -- this week, in addition to her husband, James Miller, who served as director of photography and a producer on the film, and she assured me that while the doc was originally geared toward adults, young children have fallen in love with it as well. L.A. Story: What brought you to the film? Constance Marks: My husband used to be a cameraman at "Sesame," and he came home one day -- and this is all explained in the bonus material -- with a recorded message of Elmo saying hi to our then-infant daughter, and I was just so blown away. It was so sweet, and it was just an extraordinary gesture. And I said to James, 'Who is this man who did this? Tell me about him.' That's how it got started. He told me a little bit about Kevin, and the next thing I knew I had Kevin's phone number and we made a lunch date. L.A. Story: What would you like for audiences to take away from the movie? Constance Marks: I can tell you right now, if you do a search on Twitter and put in 'Being Elmo,' what I'm consistently seeing -- and it's so heartwarming -- is that people feel incredibly inspired and moved by Kevin's story, and really inspired to follow what it is that you feel you want to do despite the fact that it might not be the most popular thing. When he was a kid, when he started doing this, he was given a hard time by other kids. He rose to the top. He's the gran fromaggio. He's the puppet master. It's just a very uplifting story, and as a filmmaker that makes me so happy that people are getting a little break from the news and from the kind of films I usually make, which are much darker films. They get to have a break and feel happy. L.A. Story: Was there anything that surprised you during the actual filming or research? Constance Marks: When I went into it, I didn't really understand how profoundly loved Elmo is and how popular he is. ... Until the film was finished and we started getting out there, I had no idea of the overwhelming popularity of this show and this character, and that was always a surprise. L.A. Story: Was your husband surprised by anything during filming? James Miller (who was in the kitchen nearby while I was interviewing Marks): I think what surprised me is all the doors that opened for us. We were able to show so many things that, in the past, there were so many rules to shooting the muppets at 'Sesame Street,' but they opened up to us and allowed such an amazing point of view that I'm not sure will be seen again. 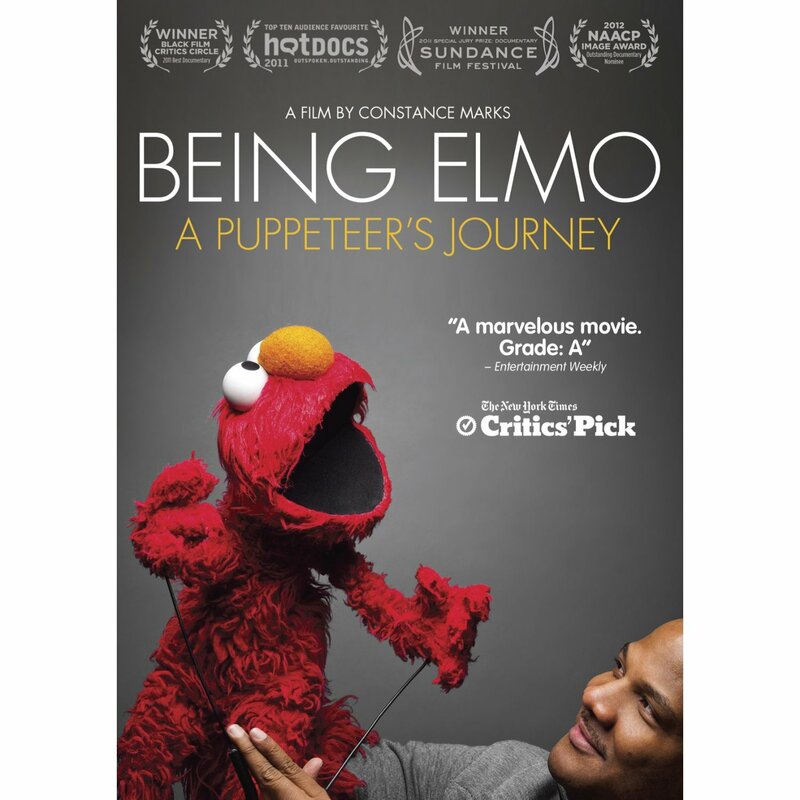 L.A. Story: When "Being Elmo" screened in L.A., I worried that some of the mystery might be lost if my daughter saw the puppeteer, Kevin Clash, operating Elmo. Could you speak to that? Constance Marks: We didn't make the film for the Elmo set; it's really a film for adults. But what we're finding is that kids about 8 and above are completely mesmerized by it. The people at "Sesame (Street)" are the most protective of that kind of thing, and they're not worried about it at all because they really know that the kids don't know who Kevin is, so their eyes don't go to Kevin, their eyes go straight to Elmo. And as Kevin likes to say, 'They see me as the person who's carrying around their friend.'" With their "Toy Story" gear locked and loaded, Woody and Buzz Lightyear were strapped into their respective race cars, ready to put pedals to the metal for our version of The Great RC Race. Her hands hovering over the launch buttons, CC suddenly shouted "Go!" And off they went! The package arrived with Mattel's newest line of "Toy Story" vehicles and figures -- RC's World Playset (SRP: $25.99); RC Racer Vehicle (SRP: $15.99); and 2 RC Race Figures, aka Woody & Buzz (SRP: $11.99 each). CC loved making up a new race scenario each time. And the cars really race! If it weren't for the shoes, Woody and Buzz would have kept flying down the hallway. To enter, share your own "Toy Story" Toymation movie, such as the one CC and I made or the Disney*Pixar version above. (Feel free to use any "Toy Story" figures your child has.) 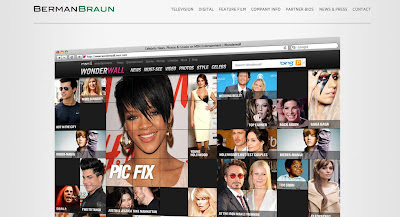 Leave a comment below with the link. Good luck, and I will announce the winner on Monday April 16!